The Sanator representing Kogi west constituency of Kogi State at the Senate chamber has just been arrested at the Nnamdi Azikiwe International Airport Abuja, on his way out of the country. He said on Monday that he was picked up at the Nnamdi Azikiwe International Airport in Abuja. If you could remember that Mr Melaye was declared wanted for his alleged involvement in a murder case and provision of support for criminal elements in his home state of Kogi. The senator later said he was blocked as he was undergoing security and immigration screening. He said he was told that the police had place him on its ‘no fly’ list and that he was therefore barred from travelling at the airport. 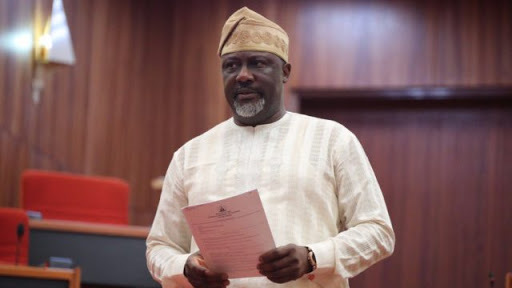 “But I was then cycled by police officers trying to hold me and saying I am on Interpol wanted list,” Mr. Melaye said. “We have called Interpol and they said it is a lie. Someone has also mentioned to me that my name was placed at the airport by a police commissioner.